City of Albuquerque residents recycle clothes to benefit students. Information about the success of the 2018 Recyclothes event. 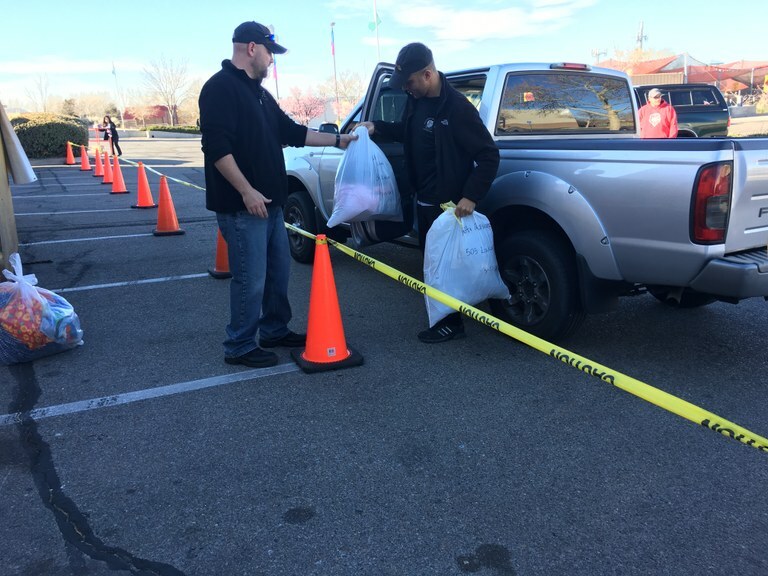 On March 17th, lines of cars filled Hinkle Family Fun Center’s parking lot as the 2018 Recyclothes Clothing Drive event began. Keep Albuquerque Beautiful hosts the annual event in partnership with Locker 505, Hinkle Family Fun Center, iHeartMedia, Donut Mart, and Oniell’s. The event is a unique way to promote the importance of recycling right. Instead of throwing away gently used clothing in the trash, participants have the opportunity to donate it to a worthy cause. Residents from the greater Albuquerque area donated 2,420 pounds of gently used clothes and accessories to help students in need. All of the donations directly benefit Locker 505, a clothing bank that provides basic necessities to students so they can focus on learning. Students served through the clothing bank receive a minimum of two sets of clothing, new socks, and new underwear. Volunteers helped participants unload their cars as the donations piled in. Those who donated clothes received a free donut from Donut Mart and a mini golf pass to Hinkle Family Fun Center. Participants also had the opportunity to enter to win prizes from Hinkle Family Fun Center, gift certificates to O’niell’s restaurant, and Keep Albuquerque Beautiful gift bags. To top off the event, Orbit the Isotopes mascot stopped by and greeted participants as they dropped off their donations. The success of the event would not have been possible without the amazing dedication of volunteers, partners, and City of Albuquerque residents. For more information about how to get involved with Keep Albuquerque Beautiful events visit keepalbuquerquebeautiful.com.